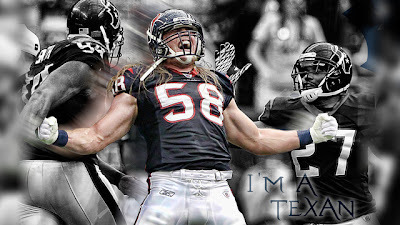 If you’re a Texans fan, you have to be thrilled with a 6-1 record at the midway point in the season. Most analysts, including myself, had them at 5-2 when we looked at the schedule before the season started. With an away game at Denver, and home tilts against the Ravens and Packers, it was easy to think Houston would at least have another loss by now. While I’m not surprised at the 6-1 record, it’s the way they’ve done it that has impressed me. Of their six wins, five have been blowouts (yes, I include the Broncos game because they were totally dominating Denver until the replacement refs started to assert their influence). Of course, naysayers will point to the near-comeback by Peyton Manning in only his third game in a new offense, the Packers’ game, beating a depleted Ravens squad, and say that Houston hasn’t beaten anyone. However, all you have to do is go back to the glory days of the 49ers in the 80’s, Packers in the 90’s, and Patriots in the 00’s, and you will see that they played in weak divisions with few marquee games during the season. While Matt Schaub is not putting up some of the gaudy numbers we’ve seen in the past, he has been exactly what this offense needs – a smart, efficient signal caller. A 10 to 4 interception ratio is all they need with this running game and defense. 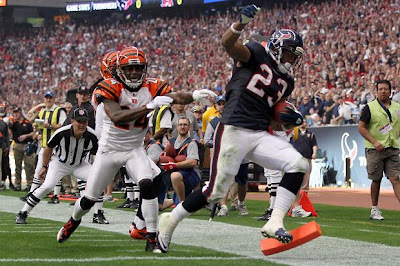 Yes, Arian Foster is leading the league in rushing, but I feel as though he’s missing some of the cutbacks that have become a staple of his game. It seems as though there are three or four times a game that he misses wide open holes created by the line on the backside. Unfortunately, Ben Tate and Justin Forsett are incomplete at this point because of Foster’s high carries total. With both having higher yards-per-carry averages they need to get on the field more. Maybe I’m being hard on them, but I just don’t see anything special from this group, and that includes Andre Johnson. Don’t get me wrong, I’m not one of the growing “Andre Johnson’s finished” crowd, but I do think that Gary Kubiak limiting his snaps is affecting his rhythm and feel for the game. Maybe he just had a couple of bad years, but Kevin Walter is putting together a much better season than he’s had in the last two. He’s still an above average run blocker, but has been much more effective getting open this year. Keyshawn Martin has been inconsistent, dropping several passes. Now that he’s healthy, I see Lestar Jean getting more snaps as the third receiver. I know it sounds strange, but this has been the best position group on the offense. Owen Daniels is now fully-recovered from his knee injury two years ago, and has become Schaub’s most trusted option. In addition, his run blocking has improved tremendously as his career has gone on. While he doesn’t get much time, Garrett Graham is proving to be a reliable receiver, very good in the run game, and may have the catch of the year with that tip job to himself against Baltimore. Sorry, but I include James Casey in this group, because he’s simply not a fullback with the way the Texans use him. I still think he could be a bigger weapon in this offense, but it’s hard to argue with the results of the gameplans by Rick Dennison and Kubiak. While they’ve done a very good job in pass protection, the run blocking hasn’t been anywhere near as effective in the past three years. Of course, this is the mix that I would prefer, considering that the primary goal this season has to be to keep Schaub healthy. Make no mistake, his health is the key to the success of this team. 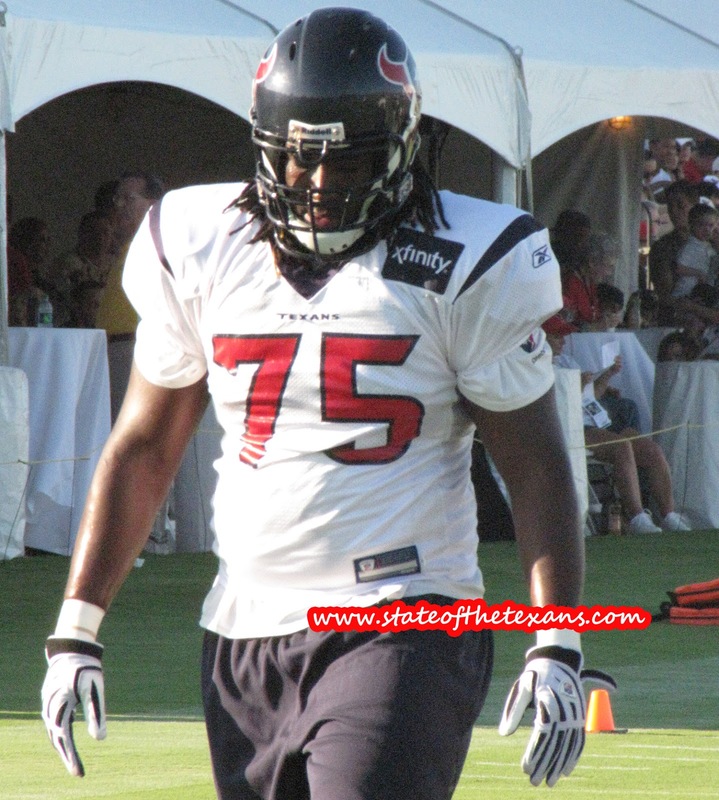 Duane Brown continues to impress and is definitely the best left tackle in football. Wade Smith and Chris Myers have been very steady, with the latter looking much stronger than in the past (if you question that, just look at how he pushed Terrence Cody (340 pounds) of the Ravens five yards off the ball on several occasions. The right side is a problem, and while I think it will get better as the year goes on, I think Rick Smith will be in the market for a right tackle this offseason. Rashad Butler is injury-prone and Derek Newton has had problems in both the run and pass game. Ben Jones has been a pleasant surprise and his improvement will keep Antoine Caldwell on the bench. I’m sure this grade will surprise some people with the play of Antonio Smith and J.J. Watt in particular, but the nose tackle and run defense up the middle has been atrocious. We haven’t seen this issue in full effect yet because the Texans have scored early and often and forced teams to pass. On running plays between the guards, you can see Shaun Cody and Earl Mitchell being manhandled by bigger guards. The game against the Bears in week 10 should tell us a bit more. 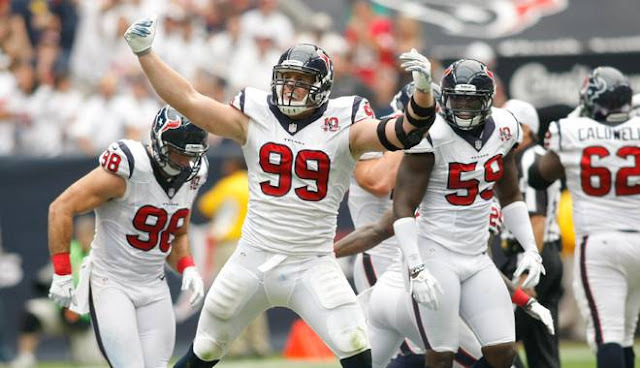 J.J. Watt has been incredible, and by far, the best player on the team. He might be the best player in the league right now. If it continues, he’ll run away with Defensive Player of the Year, and might garner some votes in the MVP race. His football IQ is off the charts, which is amazing for a second-year player, and is on display when he bats down passes. Most young pass rushers are too eager, and simply go for the sack on every play. The patience he exhibits in getting separation and extending for throws shows a maturity well beyond his years. Overall, the linebackers have been a solid unit. Sure, the sack totals for Connor Barwin and Brooks Reed are disappointing, but they’re doing a great job against the run and are still forcing the quarterback to get rid of the ball before he’d like. I look for Whitney Mercilus to get more playing time as the season progresses. He’s really come on recently and was a big factor in the pass rush against the Ravens. On the interior, the loss of Brian Cushing can be seen on a regular basis. There’s nobody on the roster that can replace his athleticism, instincts, and knowledge of Wade Phillip’s scheme. Of course, there are few players in the entire league that could play the position better than he can. However, Tim Dobbins is doing an admirable job, and I think we’ll see him take more and more snaps away from Bradie James in nickel and dime packages. James just isn’t the player he used to be. It will be interesting to see where Darryl Sharpton fits in if he’s able to come back from his preseason injury. He’s much more athletic than Dobbins or James, but he can be a real liability in the running game. Outside of the hiccup against the Packers, this group has been fantastic. On the back end, there may not be a better safety tandem in the league than Danieal Manning and Glover Quin. While Manning is a playmaker that always seems to be in the right place at the right time on pass plays, Quin is a much better player than I ever thought he’d be. Wade Phillips has done a magnificent job in utilizing him, whether in coverage or in blitz packages. As for the cornerbacks, Jonathan Joseph is certainly not as good as he was last year, when I graded him as the second-best cornerback in the league, but he’s still in the top ten. The groin injury is bothering him, and his play has dropped off in the past few weeks. On the other hand, if you hear anyone speak poorly of Kareem Jackson this year, you have my permission to smack them in the face. His turnaround in the last two years is a credit to secondary coach Vance Joseph, but even more so, to Jackson himself. In playing a position that requires the utmost confidence, his ability to put the “ugly times” behind him is beyond commendable. What I’m most impressed with is his improved technique which has allowed him to overcome his lack of top end speed. Lastly, Brice McCain has turned into an above-average nickel corner. His work against slot receivers has been pretty good, and it will be interesting to see the matchup between him and Wes Welker in week 14. To call the Texans teams “not very special” is an understatement, to say the least. They rank in the high 20s in both coverage units, and the same in both kickoff and punt returns. For the most part, I think it points to too many young players and a lack of depth. I’m not sure if you can correct it at midseason, so Houston will simply have to grin and bear it for the time being. In my opinion, I think using Danieal Manning for kickoff returns would provide a huge advantage in that area. He’s been terrific in the past, and I understand the injury factor, but if it’s as important as Kubiak says it is, it’s the only way to resolve it. As for the kickers, Shayne Graham couldn’t be much better than he’s been. He’s only missed one kick and it was over 50 yards. He ranks fourth in scoring, and has been an upgrade over both a Kris Brown and Neil Rackers. The pickup of Donny Jones was a solid one and he has not disappointed. While he’s in the middle of the pack in both average and net, he does a good job placing punts inside the 20 and has put the defense in great position with kicks killed inside the 10. For the most part, play-calling on both sides of the ball has been excellent, especially Wade Phillips. His ability to make the right call in most situations is uncanny, and Houstonians should be extremely happy that he decided to come home in the twilight of his coaching career. Where the coaching staff slips a little is in the adjustments and mental breakdown areas. Both can be summed up perfectly in the Green Bay and New York Jets games. Nothing worked against the Packers, and the Texans simply kept trying the same old, same old to get back in it. Then, costly penalties gave the Packers new sets of downs on two of their touchdown drives. The nail in the proverbial coffin came on a total secondary breakdown where Green Bay tight end, Tom Crabtree, ran down the field untouched, with nobody within 20 yards of him. I could have thrown the touchdown pass that put them up 35-17. Against the Jets, the only thing that kept New York in the game was the Texans themselves. Even though the offense controlled the ball for over 35 minutes and outgained the Jets by almost 100 yards (169 to 69 in rushing), they needed a last minute stop by the defense to prevail. The reasons: Schaub having his worst game of the year, special teams gaffes, and seven penalties (all seemingly coming a the absolute wrong time). 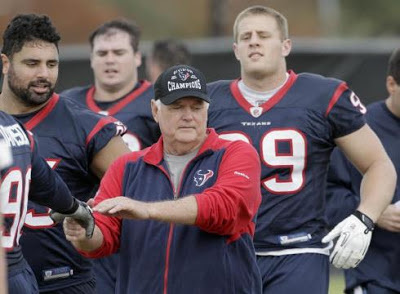 These are correctable issues that need to be resolved soon or the Texans will find it hard to beat the better teams in the postseason, especially if they end up in the Super Bowl. More than likely, they will play a superior team from the NFC, and surviving these kinds of mistakes will be difficult. For those of you who think that I might be attributing too much of this to the coaching staff, just remember Kubiak’s signature line when it comes to mental errors: it’s on him. Overall, I give the team a B+. Coach is not trying to kill them, and I see them leaving early (normally in meetings - boring). Let's see what happens NOW... Later.